Change and challenges are constant realities in our work and personal lives. Occasionally, we enjoy surprises – Amazon delivers a package early or our investments deliver higher than expected performance. Such surprises are easy to understand and appreciate on their own merits. Problems, especially those from the external environment, are more frustrating. Furniture was delivered a week ahead of schedule and required much more household work than expected to get the furniture in place. This experience shows that early delivery can cause problems. Arriving on short notice at the end of a busy weekend, this was a challenge to get through. Recently, I walked in the office with a full agenda of tasks to complete. There was plenty to be done. However, I was surprised by an urgent management request. I had some concerns to overcome initially because the request involved a new type of financial analysis. Once I determined my approach to satisfy the request, I reviewed my other tasks and appointments for the rest of the day for impact (there was limited impact that day). Fortunately, this type of challenge is rare so I can generally accommodate these surprises. Senior managers have plenty of problems to contend with so I like to help whenever I can. From time to time, I ask for assistance to grow this website. I’m proud of the work I’m doing and want to share that message. That means getting the word out (i.e. marketing). Marketing efforts do not always pay off. This is a challenge that I encounter with regularity. Getting through these disappointments is tough! In these moments, I’m often reminded of U.S. President Theodore Roosevelt’s famous ”In The Arena” speech of 1910. Coping with challenges is unavoidable on the path to success and satisfaction. While preparation and good habits do reduce the likelihood of negative events, you can never eliminate them entirely. That’s why I’ve been working on the ABC Problem Solving Strategy to respond to unexpected challenges, disappointments and problems. Like many techniques, it takes practice to get it right. I hope you will join me in using this strategy to improve your effectiveness in the office and beyond. This model combines reactive and proactive techniques to keep you ahead of challenges. I’ve laid out the steps based on the premise that you’re suffering from an unexpected event right now. Instead, I recommend assessing the impact of the event on your important relationships. After all, very few important activities are completed by a single person. Use these discussion points to assess the impact of a major challenge. Imagine you that you receive bad news at the office. You’re going to be working late to address the problem. In all likelihood, that event is going to affect your family. At a minimum, tell your family about the situation and when you expect to get home. In other cases, you may need to discuss the impact and use conflict management techniques. Many professionals have colleagues who they depend on in order to accomplish shared objectives. Do you need advice from a colleague on the best way to proceed? Will challenge cause you to delay producing a deliverable for someone? Tell your colleagues about the situation once you give some thought to the impact on them. Large organizations are one of the best tools we have to accomplish significant results. However, large companies also make communication more difficult especially if your organization has a silo mentality. For very large challenges, I recommend performing a process analysis (i.e. a list of every step of the process and who completes each step). If you don’t know who may be impacted, start asking people! Finally, take a broad view of stakeholders – suppliers, government, customers – who may be impacted by the challenge. Imagine you were a customer, client or patient of your organization – would you benefit from knowing about the challenge? Tip: Read 17 Ways to Meet Tomorrow’s Challenges by Dan Rockwell for further guidance on to minimize the impact of new challenges. Working through a challenge is serious business. It is reasonable to start the process on your own. What if you realize that you’re in over your head? Or simply anxious about the right solution? 1. Define the problem in brief. You may think of the problem as a long and complex story (“first the order was late, then customs caused other problems, then…). It is difficult for people to help you when you describe problems in this way. Developing solutions before you ask for help shows that you have some creativity and have applied your creativity to the problem. Tip: For even better results, start practicing The 10 Ideas approach proposed by entrepreneur James Altucher in his excellent article The Ultimate Guide for Becoming an Idea Machine. 3. Ask for advice or assistance. Present a crisp definition of the problem and two solutions. Ask for help and see what happens. If you want direct help, rather than advice or suggestions, make that clear (and be ready for the person to say no). 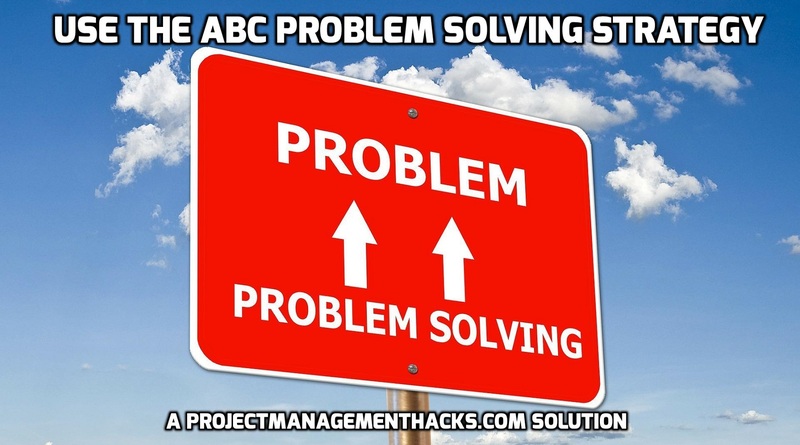 The first two components of the ABC Strategy help you to overcome your immediate challenge. Keep working until you solve the problem. Eventually, you will put the problem behind you. Once you reach that stage, you now have the opportunity to change your calendar. It’s a sad reality that many of us feel compelled to schedule each and every hour – and that includes me! When you are fully scheduled, small challenges have an disproportionate impact. I schedule my days to only 40% that way if there’s a problem or an error I can have more time to do what needs fixing. I think a lot of people run their life in this other way. They schedule their days to 120% and then they’re always dropping plates all over and they feel completely hectic. I think the payload and payoff of having the chance to stop and make eye contact in a hallway is so vital. The chance to grab a cup of coffee with somebody, to really explore a story is so vital, especially if you feel that the person is heading in the same direction. Confine all appointments to a single day (see: Michael Hyatt’s Ideal Week concept). Maintain one weekend day free of appointments and commitments. Prevent negative surprises by conduct a regular Weekly Review. Of the above strategies, I have the greatest success with the third idea. Your mileage may vary. What is your system for overcoming challenges at the office and beyond?